That day when you head out to the car and find a fine, yellow powder all over the windshield? It’s right around the corner. And the winds that spread all of the Juniper pollen have already arrived. Forecast: runny nose, itchy, watery eyes, post nasal drip, and a brain fog that could turn Einstein into John Travolta. If you’re looking for a little natural relief, Verde Juice may have something that can help. Histamine is a natural chemical released by the body in response to a substance the immune system mistakenly believes is harmful. To protect itself, the body releases histamine into the bloodstream, which causes capillaries to become more permeable. The dilated blood vessels allow fluid to escape more easily, resulting in redness, swelling, runny nose, and extra mucus in the respiratory system. Because histamine is a neurotransmitter, it transmits messages to the brain through the spinal column over emphasizing nerve endings in the infected area that sense itch. A little itching releases endorphins, so there is a brief sense of relief. Too much itching, causes the release of more histamine and an itch-scratch cycle of doom. Allergic brain fog, too, is caused by histamine. Glucose, the primary energy source for brain tissue, is partially regulated by histamine which impacts thought and mood. Histamine is also key to the sleep-wake cycle, or circadian rhythm. The body produces histamine during the day, helping the body maintain a more wakeful state and that means the overproduction histamine can actually affect your nighttime Zzs. One of the best natural antihistamines is flavonoid called quercetin, which reduces the release of histamine. The best source of quercetin is capers, but they are unfortunately quite high in sodium. Onions are great, too, but your co-workers might not appreciate your onion-heavy anti-allergy diet. Some easier options high in quercetin include watercress, kale and apples. The benefits of quercetin are increased when combined with Vitamin C and bromelain. Vitamin C is another natural antihistamine and inflammatory and aids in the elimination of excess histamine from the body. Bromelain is an enzyme in pineapple that stimulates the production of antihistamine prostaglandins. 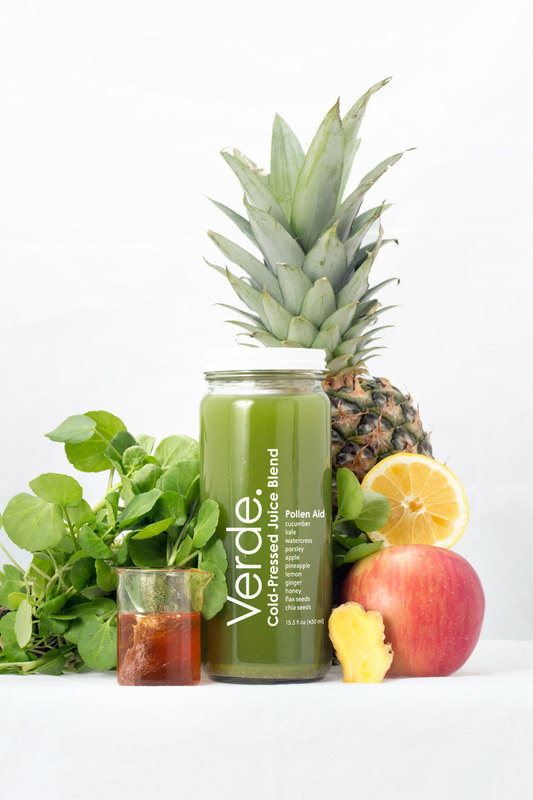 Wondering how Verde Juice fits in with John Travolta, capers, and allergy relief? Our Allergy Season favorites are back now. You can give our Pollen Rescue juice blend a try or our Allergy Wellness Shot. Of course they are delicious, but they are both carefully crafted to be naturally high in quercetin, bromelain and Vitamin C. These may help you find some relief from allergy symptoms without the onion breath.